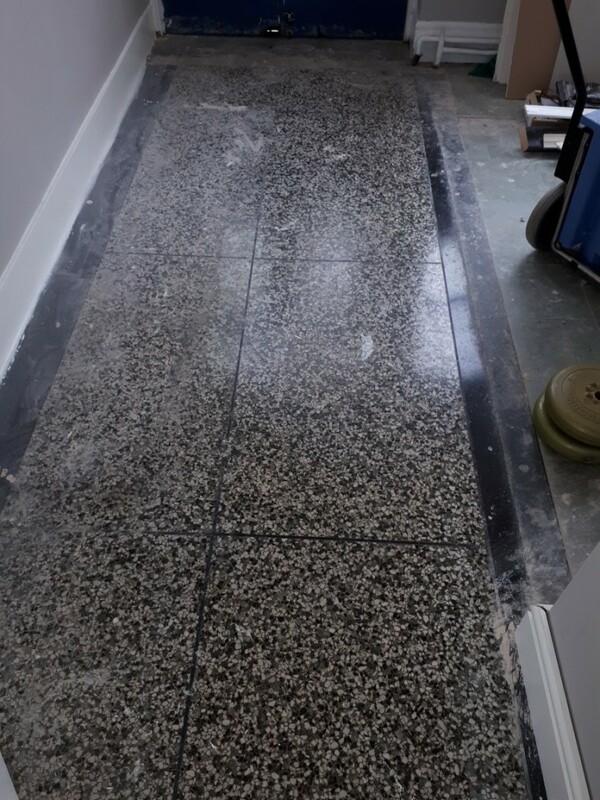 We recently took a call from a company based in Oldbury asking if we could restore a natural stone floor that had been covered for over many years. The company were unsure exactly what type of stone the floor was made of, so I agreed to visit the site to survey the situation and quote a price for restoring the floor. Oldbury is a town in the West Midlands, not far outside of West Bromwich, which has a history dating back over 1,000 years. It has historically been home to several notable businesses include Lloyds Bank who opened their first branch here back in 1864. 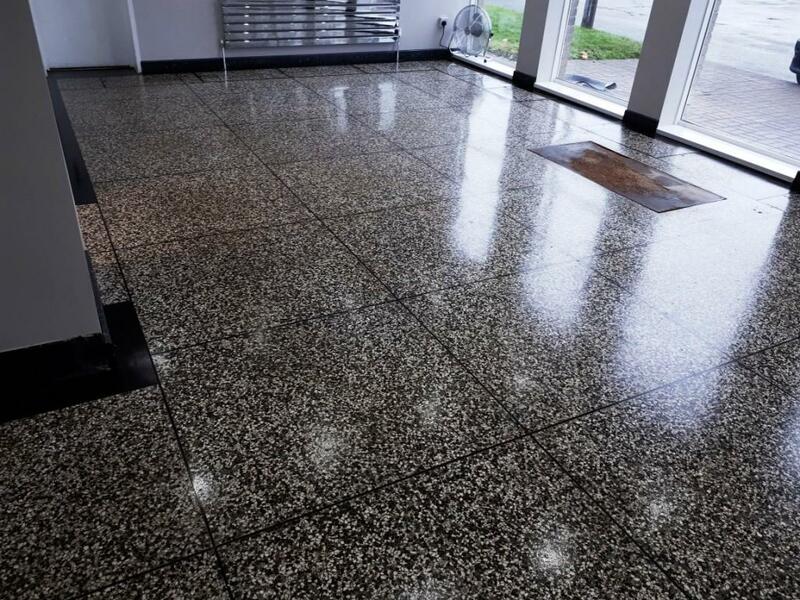 Upon visiting the company, I quickly identified the floor as Terrazzo, which is made from a process that was originally invented in Italy and popularly used in the UK during the 1920s. One of the most famous examples of Terrazzo stone in use is the Hollywood Walk of Fame in California. The floor was stained around the edges with what appeared to be paint smears from decorating and judging on its current appearance I could see it had been some time since it had been professionally cleaned. The floor was structurally sound however and I was confident however that a good finish could be achieved. The floor was in a big open reception area of the building with a couple of hallways leading off it. We decided to clean the floor on a Friday afternoon when the workforce was not in the building to minimise the disruption. 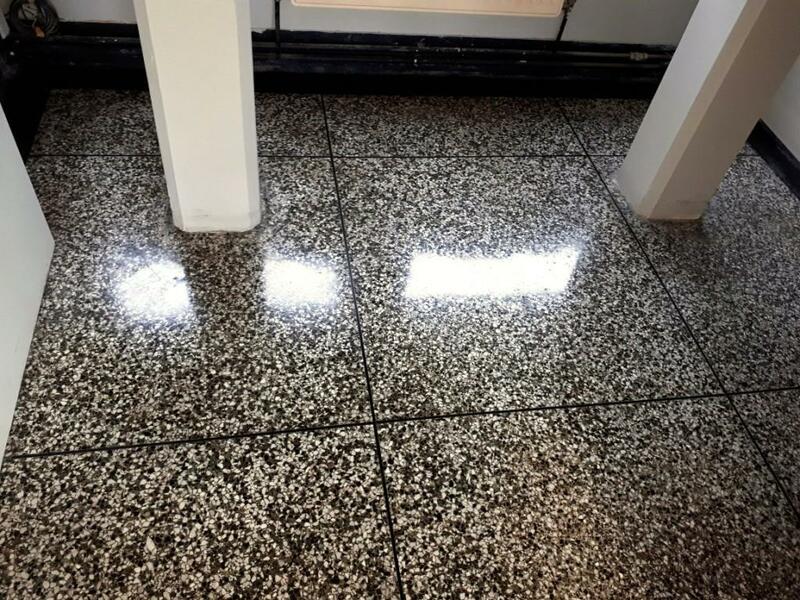 To begin the restoration, we covered the floor in Tile Doctor’s alkaline-based cleaner, known as Tile Doctor Pro-Clean, mixed in medium strength solution as the floor was quite dirty in places. The solution was left to dwell on the floor for about twenty minutes and we then processed to carefully scrape off the paint a process made easier by the Pro-Clean. The cleaning solution was then scrubbed thoroughly into the tiles using a rotary machine fitted with a large black scrubbing pad. The resultant slurry was then rinsed with water and extracted using a wet vacuum. With the floor clear of surface dirt, the next step was to burnish and re-polish the floor using a set of Tile Doctor burnishing pads. The system consists of four diamond encrusted burnishing pads of varying levels of grit, which are fitted to a rotary floor machine. The pads are used sequentially, starting with the coarsest 400 grit pad and ending with the finest. A small amount of water is used for lubrication with each pad and the floor is rinsed in-between each pad. After the 1500 grit pad had been applied the floor was given a final rinse with water which was then extracted using the wet vacuum. The floor was then left to dry off fully overnight. We returned to the building the next day (Saturday) and immediately ran a damp test on the floor to check if it was dry enough to be sealed. 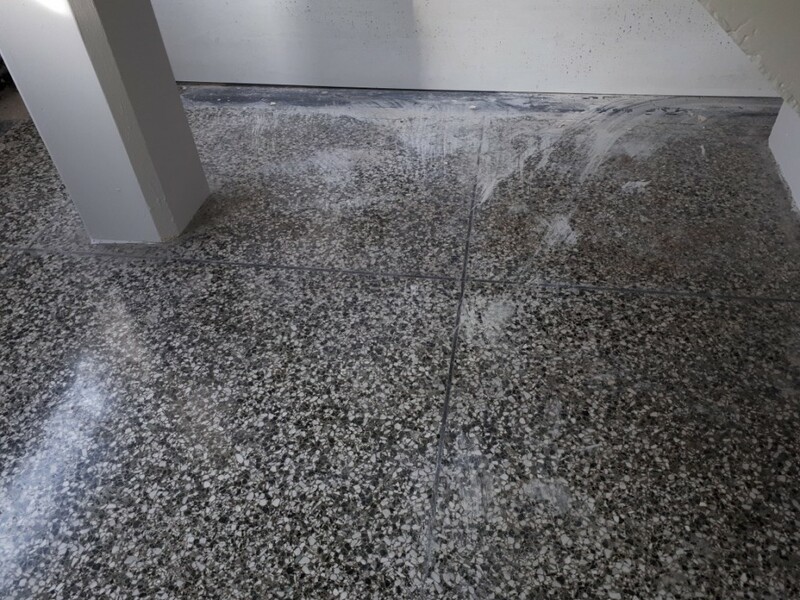 The floor proved to have dried completely, but before sealing the last very fine 3000 grit burnishing pad was applied with a little water spayed onto the floor to really bring out the shine in the Terrazzo. Once this had been done, we applied two coats of Tile Doctor Colour Grow to seal the tiles and then allowed them to dry off. Colour Grow is an impregnating, colour intensifying sealer that helps to compliment the polished finish. Once the floor was dry, we buffed up the floor with a soft white pad. Before leaving, we gave the customer a complimentary bottle of Tile Doctor Neutral Cleaner, a product which is ideal for routine cleaning of sealed floor to help keep the floor looking great. The customer was very happy with the results! You can judge them yourself by comparing the photos above with the ones below.